Just like a "real" newscast, the news team held a pre-production meeting and came up with a rundown before taping. Working as a team, all members hosted and took turns on camera and lights. 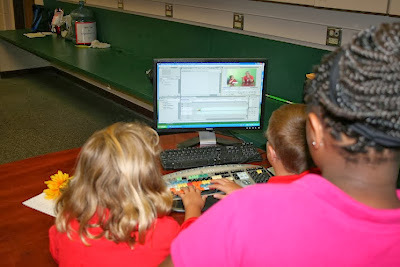 Editing is done by the crew after taping, in the mornings before school. One of the remarkable things about this program is the support that parent volunteer Holly has contributed over the years. She has had several children go through the program, and has been a consistent source of help to Mrs. Foreman and the crew. Holly is seated next to Ms. Foreman below. I (Matthew Lahey) was honored to be interviewed for this episode. In being interviewed, I joined the ranks of Huntsville Independent School District Superintendent Dr. Steve Johnson and esteemed Huntsville Attorney and School Board member Sam Moak (among others). Matthew's view from the interviewee chair. Courtney shares the results of Teacher of the Month voting results. Brendan gets the lowdown from Mrs. Foreman on the camera. Mrs. Foreman demonstrates the proper way to handle a tripod.